New Gmail and iPhone applications save people from making fools of themselves. Instant communication is all well and good until you drunkenly call an ex-girlfriend from your cell phone in the wee hours of a weekend morning, or send your boss an e-mail that was never intended for him, because it was about him and how he stinks. In recent days, the very companies synonymous with Web 2.0, Google and Apple have offered a series of new applications intended to save you from your own stupid self. Say goodbye to errant e-mails and drunken dials and say hello to a future in which you can no longer blame the computer for all the dumb stuff that comes out of your fingertips. "I wish there was a way I could have gone back to undo that message." she said. "Although part of me thinks he deserved to find out what I really thought of him." Google has yet to develop a program that will eradicate the advances of caddish exes, but it rolled out an application Thursday that will allow Gmail users, such as Feola, to stop an e-mail from being delivered with the click of what the company aptly calls a "panic button." Users of Gmail, the popular Web-based, e-mail service, can now install an "Undo Send" application that gives them five seconds to stop an e-mail from getting delivered. On the Official Gmail Blog where the new application was announced, Michael Leggett, a Google user-experience designer who created the application, said it was all those sent messages that contained mistakes or promised files that were never attached that led him to design the "undo" button. "This feature can't pull back an e-mail that's already gone; it just holds your message for five seconds so you have a chance to hit the panic button," Leggett wrote. Users looking to turn on the "Undo Send" button can find it in Gmail Labs under "Settings." The recent proliferation of programs designed to make you not look like an idiot are "partially gimmicky" but also reflect a desire to keep communication technology working at the speed of thought and not the speed of your bandwidth connection, said Nate Westheimer, a tech blogger and the entrepreneur-in-residence at Rose Tech Ventures in New York City. "Everything is becoming more real time," he said. "Technology makes things more immediate, which means screwups happen even faster. In the past, you wrote a letter, proofread it, put on the postage, walked to a mailbox and thought about what you wrote. There were opportunities to say, 'I probably shouldn't say that.' Now you just type and send." Google has been something of an industry leader in creating applications intended to keep people from making asses of themselves via e-mail. 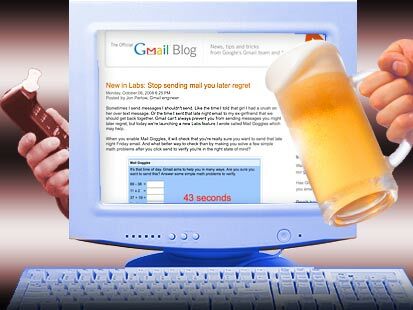 The company last year introduced a service called Mail Goggles (a playful riff on Beer Goggles) that asks users to complete a few simple math problems within 60 seconds before being allowed to send off those late-night, alcohol-induced e-mails. If you can make it through the math, your message goes on its merry way, and you can continue to e-mail without further checks, although there's no stopping your text messages. But if you have difficulty solving "5 times 2" or "94 minus 33," you're gently chastised by your e-mail: "Water and bed for you" or "Oops. Looks like your reflexes are a little slow," if the time runs out. By default, Mail Goggles only "Breathalyzes" you on the weekends between 10 p.m. and 4 a.m. But once the program is enabled, users can adjust when it's active as well as the level of difficulty. The program won't reach math of Pythagorean proportions, but it does let math whizzes raise the bar to keep themselves out of trouble. In announcing the feature on the Gmail blog, Gmail engineer Jon Perlow wrote, "Sometimes I send messages I shouldn't send. Like the time I told that girl I had a crush on her over text message. Or the time I sent that late-night e-mail to my ex-girlfriend that we should get back together. "Hopefully, Mail Goggles will prevent many of you out there from sending messages you wish you hadn't," he wrote. Both "Undo Sent" and Mail Goggles are free applications for Gmail, which is also free. Not to be outdone, developers of iPhone and iPod applications, with programs that do everything from count calories to translate foreign languages in the palm of your hand, have created a number of features to keep you from making drunken screwups. 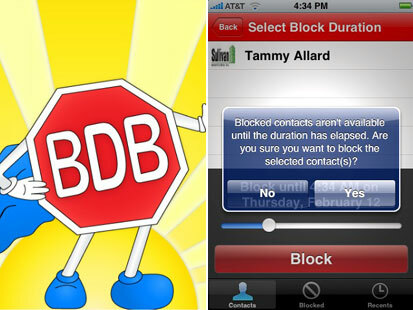 Apple began Wednesday selling the Bad Decision Blocker, an application that lets users block the numbers of people (such as an ex-boyfriend) saved in their phone's address book. "It lets you select the person you'd like to block and then set the duration," said the app's designer Dan Burcaw, the CEO of Double Encore. "It takes that person's e-mail address and phone number out of the address book entirely. It puts it in a secret place that is not readable," he said. The app sells for 99 cents at the Apple Store's Web site. 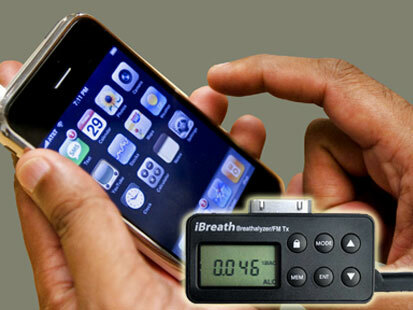 Perhaps the most ambitious device to keep you from doing something really stupid is the iBreath, a breath-test device that attaches to your iPhone or iPod. "People listen to their iPods more than they listen to their parents or friends who might be trying to give them good advice," he said.